Frozen shoulder is a painful condition that occurs in about 2% of people in the United States. 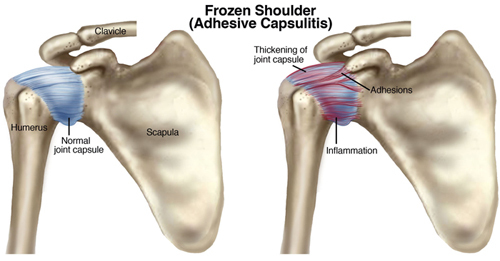 Also known as adhesive capsulitis, frozen shoulder usually comes on slowly and can lead to complete immobilization of the joint. Besides,it also brings about pain and stiffness. Sometimes it is caused by a medical condition, such as diabetes or a stroke. It can also happen after an injury. Pain usually begins first, followed by gradual stiffness and limitations on movement. It worsens at night. The pain gradually goes away, but the stiffness and limitations on movement stay and may even get worse. Rotating your arm outward might be impossible. This is the recovery phase, during which the pain, limitations and stiffness gradually go away. If you have limited shoulder movement, your doctor might immediately suspect frozen shoulder might be the culprit. Your doctor will likely to give you an x-ray to make sure the symptoms are not from another problem, such as arthritis or a broken bone. You might also need an MRI or an ultrasound to determine if the problem is with the soft tissues, such as a rotator cuff injury. No one knows for sure what causes frozen shoulder and why it happens to some people but not to others. Sometimes it can be caused by scar tissue or tissue that has tightened up. But for some others, the reason is often unknown. Doctors do know that people who have had to keep their shoulder immobilized, such as those who have suffered a fracture or had surgery, are more likely to develop frozen shoulder. Sometimes chronic conditions, such as diabetes or arthritis, might be a factor as well. Those who are over 40 years old are more likely to have the problem. It happens much more commonly in women than in men. If you have been immobilized for a long period of time, your chances of frozen shoulder increase. The most common reasons for an immobilized shoulder include a stroke, a broken arm, a serious rotator cuff injury, and recovery from surgery and so on. There are several medical problems that can lead to frozen shoulder, including Parkinson’s disease, tuberculosis, cardiovascular disease, diabetes, or problems with the thyroid. This therapy includes transcutaneous electrical nerve stimulation (TENS), acupuncture, massage, heat and cold compress and stretching techniques to relieve and add flexibility to the frozen shoulder. In most cases, over-the-counter medications can be all you need to deal with the pain of a frozen shoulder. However, sometimes the pain is worse than what the OTC medications can help; in that case, your doctor might prescribe stronger pain relieving medications. Corticosteroids might be able to reduce the inflammation and add mobility to the frozen shoulder. The shoulder tissue is very tight, so loosening it up with an injection of sterile water can help stretch it out and allow for more freedom of movement. If you are suffering from a serious immobilization due to frozen shoulder, your doctor can put you under general anesthesia and manipulate your arm to increase your range of motion. However, if the frozen shoulder is severe, too much of this movement can lead to bone fractures in the area. When nothing else works, surgery to remove the tight tissue, scar tissue, or other adhesions in the joint might be the good option. This is usually performed with small incisions and tools and doesn’t require a long recovery period.